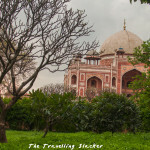 One of the better known myths in Delhi is about Tughlaqabad, the third city of Delhi. I am sure everyone must have heard the story of Nizamuddin Auliya who cursed Ghiyasuddin Tughlaq (Easily googleable even if you do not know). But in spite of almost a millennium of neglect, the Walls of Tughlaqabad still stand and they stand tall. It can be seen for miles and the sheer scale of the fort mesmerises everyone. We first thought of reaching the Tughlaqabad metro but later decided to take the more interesting route, that from Govindpuri metro to Hamdard University on a shared tempo. From there we walked along the Mehrauli Badarpur Road for 15mins to reach the Fort. Before entering the Fort we decided to visit the other two monuments situated in front of it. The tomb of Ghiyasuddin Tughlaq is of course located just on the other side of the road. I’d seen it before from the outside but I hadn’t realised it’s enormity from inside. The big gateway and walls seen from the outside were only the outer walls. This Tomb follows the structure of Tughlaqabad Fort itself with two layers of walls. The long causeway that leads it from the road probably was connected to the Fort itself when it was built. The actual Tomb located inside is the usual domed structure made of bright red sandstones and marble. However, a were surprised to see how well maintained it was with well manicured lawns all around. In fact it is built like a miniature Fort with solid bastions on all corners. After the tomb, we moved towards the Adilabad Fort, which is located a few hundred years ahead, separated by a vast open field where local kids play cricket. However, this area was probably used as a moat. The remnants of the same can still be found in the small pond that remains in one corner of the compound. Adilabad, was built by Muhammad bin Tughlaq, the most enigmatic of the Delhi rulers. He built this probably because he wanted to have something of his own instead of just using the fort built bybhis father. Just like the Bijay Mandal near Kalu Sarai, this is another construction that confuses people. Since the massive Tughlaqabad Fort is there already, I do not think there was a practical need for this Fort. It was purely a whimsical construction and there lies the beauty of it. Although dwarfed by its neighboring predecessor, Adilabad itself is a pretty huge structure. The outer walls are mostly destroyed now and only parts can be seen. There is a hill that can be seen at a distance on ghe south. It is actually a massive garbage dumb that has been building up for years. Authorities have also started using some of the inner courtyard for gardening purpose and at times the people from nearby Air Office station come jogging here. All these elements combined, one gets a confusing feeling no more different from what was running inside Tughlaq’s own head. It is hard to describe the Fort. It was not a mere fort but a huge city protected by massive walls. As of now, various parts of the same exist in various states of decay. Describing all of them will be tedious and in any case I am not really knowledgeable enough to do so. At the end, we climbed to one of the tallest remaining structures can caught a good sunset along with a good way of the entire necropolis, while playing some 60s blues. Although it was not planned, I was pleasantly surprised to see that it was also a full moon day.